The Bicycle Music Festival is the largest 100% bicycle-powered music festival in the world. The free, all-day (and into the night) event takes place annually in San Francisco, California on the Saturday closest to the summer solstice. 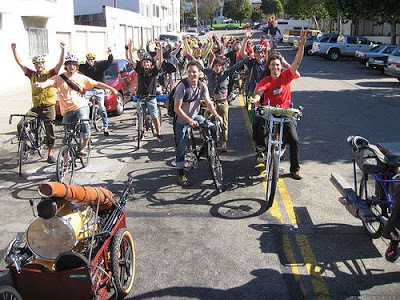 The Bicycle Music Festival features: a 14,000 watt pedal-powered PA system, as many as 15 bands, multiple festival stops, outrageous Critical Mass-style bicycle party caravans between festival stops, and zero use of cars or trucks. With its completely bike-haulable stage, the event is packed up and deployed numerous times: staged sequentially at different public parks and also on a moving “Live On Bike” stage which rolls down city streets. The festival is run by a team of over 40 volunteers and is supported financially both by donations from the public (mostly gathered at the event), and through partnerships with hip companies. The festival began in 2007, and has since doubled in size each year. Like Critical Mass (another SF-birthed bike spectacle) the concept has begun to be emulated around the world. We encourage you to start one in your city! 1) The human-powered P/A system, which besides being the most fun and green way to amplify a live concert, also transforms every song into an audience participation song, and radically democratizes the concert-goer experience (the power to amplify the people onstage rests entirely in the will of the people offstage; democracy at its healthiest you might say!). 2) Bicycle-mobility of the entire festival: the entire audience/band/stage/crew completely packs-up everything they bring (stage and musical equipment too) onto bicycles, and travels as a large group to the next festival stop. There are no sag-wagons or equipment trucks hauling the amplifiers and other heavy gear – everything is hauled by bicycle. 3) Pilgrimage-style sequential venue schedule: Unlike other festivals where bands are scheduled to play overlapping slots on stages that are set-up just around the corner from one another (often resulting in overlapping sound), the Bicycle Music Festival unfolds like a delightful treasure hunt: in a linear and adventurous journey-form, with only one meaningful development in the plot unveiled at a time, and stages located a full bike-ride away from each other. 4) Live On Bike mobile stage: Artists and bands perform while rolling down the city streets mounted on the backs of cargo bikes and bike trailers outfitted with microphones and amplifiers. The sound is wirelessly routed to “soulcycle” party bikes interspersed throughout the crowd, surrounding the crowd with sound. The Bicycle Music Festival and its pedal-powered PA system are not only wonderful ways for the community to quite literally empower itself, but also a wonderful way to remind ourselves as we generate electricity with one another, shoulder to shoulder, where power is ultimately rooted.